The process of writing and running that script maps almost perfectly onto the process of mathematical modeling. If the same defective wiring runs through your brain as mine, you’ll understand how that was a total rush. I hope NCTM will make these resources easier to find in the future, especially for non-members. This is just like mathematical modeling! I’d been using the same script for this task for the last two years, but NCTM switched website vendors this year and I had to create a new one. On the one hand, accessing handouts from the conference probably shouldn’t be so challenging. On the other, this process is such a fun puzzle for me, and maps almost perfectly onto the process of mathematical modeling. Here is what I mean. The third step in the modeling cycle is to “perform operations.” I’m not here to tell you that people (old or young) should never perform operations, just that computers are generally much faster at it. When I thought about the task of poking my head into all 740 NCTM session websites and asking, “Hello. Any handouts in here?” I admitted defeat immediately to some software. So the human’s job is the first two steps: identifying essential variables and describing the relationships between them. Computers are much, much worse at this than humans. That meant looking at cryptic computer chicken-scratch like this and asking, “What do I need to tell the computer so it knows where to look for the session handouts? If you notice that each session has its own four-digit “id” and that each handout has been tagged with “viewDocument,” you can tell the fast machine where to look. But the modeling cycle doesn’t end there. Just like you shouldn’t paste the results from your calculator to your answer sheet without thinking about it, you shouldn’t paste the results of the fast machine’s search to your blog without thinking about it. You have to “validate the results,” which in my case meant poking around in different sessions, making sure I hadn’t missed anything, and then revising steps one and two when I realized I had. I hope NCTM will make these easier to find. These handouts are basically advertisements for the conference without substituting for attendance. (No prospective attendee will say, “I was this close to attending but then I found out some of the handouts would be online.”) If they’re easier to find, not only will existing attendees be happier but non-attendees will have a nice preview of the intellectual activity they can expect at the conferences, making them more inclined to attend the next year. Nothing but upside! Say Hi at NCTM 2017! I’m on a shortened schedule at NCTM this year but I’m making the most of it. Here’s where you’ll find me. Robert Kaplinsky and I would like to help you propose a session and and present it at NCTM. Robert has served on the NCTM program committee and will help you understand how proposals are evaluated. I’ve presented professionally for nearly a decade and will offer my own playbook for designing and delivering presentations. Our motives are selfish. So many of you have stories to tell and insights to offer. Our profession needs them out of your head and into all of ours. Stop by the exhibit hall and say hi sometime between 3PM – 4PM. Tell me what you’re working on. For the last two years, ShadowCon has functioned as a sort of research and development arm of NCTM’s program committee. Zak Champagne, Mike Flynn, and I study an idea on a small scale (filming every presentation, for example, or giving every presenter a webpage for follow-up discussion) and NCTM uses our data to decide if they should expand the idea to more presenters. This year, we have four exceptional presenters – Cathy Yenca, Anurupa Ganguly, Kassia Omohundro Wedekind, Geoff Krall – offering provocative ideas and we’ll study a new template for conference follow-up. 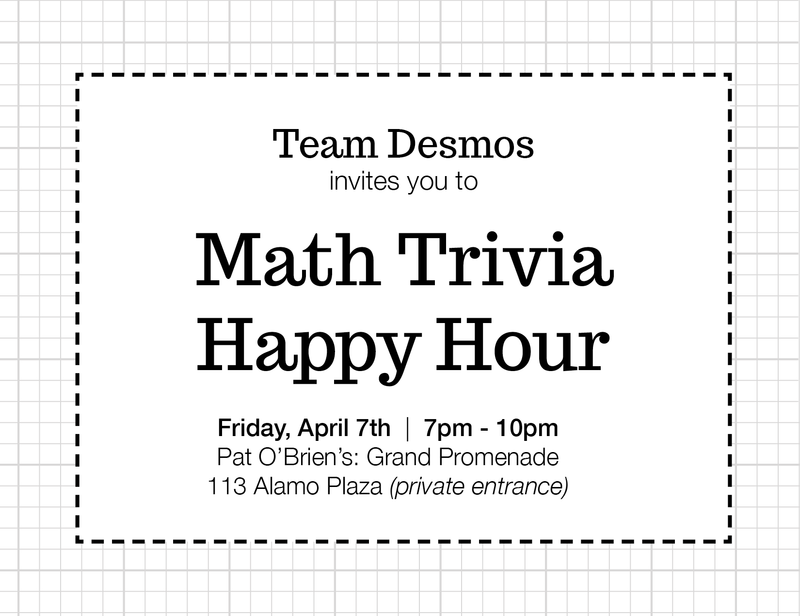 Even before I worked at Desmos, this was my favorite happy hour. Great energy. Great people from all across NCTM’s membership. Come for a free drink. Stay for the math trivia. Doors open at 7PM. Trivia starts at 8PM. This is the last time I’ll give this talk, the accumulation of a lot of thinking and designing around Guershon Harel’s concept of “intellectual need.” I’ll start by pointing out that the software engineers at Desmos and the summer school Algebra II students I worked with in Berkeley had very different answers to the question, “What would your life be like without variables?” Then we’ll figure out how to bridge those answers. 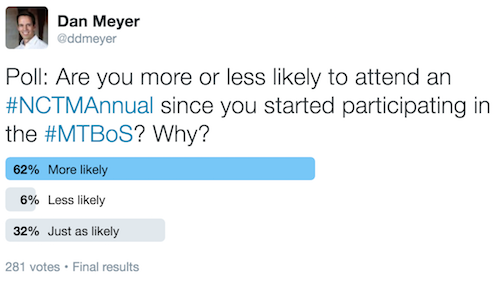 There is a 95% chance that each of my sessions will be filmed. I mention that in case you can’t make the trip to San Antonio and also because, even if you can make the trip, there are lots of amazing sessions in each time slot. In the comments, let us know what you’re excited to do and see at NCTM. BTW. If you’re feeling even a little bit intimidated by the deluge of people and ideas at conferences like NCTM, I recommend you read Nic Petty’s 10 hints to make the most of teaching and academic conferences. … looking at climate change over a short period of time gives one picture, but enlarging the frame to geological scale shows great fluctuations in temperature. This argument becomes “fuel” for people who claim that global warming is not a problem – yet the current dramatic increase (sometimes called the hockey stick) convinces many people (myself included) that action is needed. This seemed like a job for a Desmos activity. Here is one where students crop climate data in two different ways, using those selections to make two opposite claims about the data, experiencing firsthand how easy it is to distort data. I doubt I’m NCTM’s median or ideal member. Accommodating all my wishes below might be a great way to doom the organization. That said, my wishes are the only ones I have. So make yours known too. NCTM membership promises lots of benefits, but chief among them in my mind are advocacy, professional development, and community. Here are some thoughts about NCTM’s present work in each of those three categories and some hopes for its future. At a time when everybody seems to have an opinion or a comment, it’s really hard for me to locate NCTM’s opinion or comment. There were three years between the release of the final Common Core State Standards and NCTM’s statement announcing its support. Borrowing from Twain, lies about the array model can travel halfway around the world when NCTM takes three years to put on its shoes. Or try to find NCTM’s advocacy more recently. By my count, The Atlantic has published six articles about math education since December. NCTM is quoted in none of them. Am I expecting too much? Do these reporters even have NCTM’s number in Reston, VA? I throw my dues into the collection plate so that, collectively, math teachers can have a louder megaphone than any one of us would have individually. I experience NCTM’s professional development efforts through its journals and its conferences. Let’s talk about each. I’ve had the latest issue of Mathematics Teacher in my backpack for the last three weeks. I’m trying to figure out why it doesn’t seem like urgent reading to me whereas there are about twenty math education bloggers in my feed whose posts will not wait and must be read immediately. I’m also wondering why I give JRME, NCTM’s academic journal, a lot more scrutiny relative to the teaching journals. Here’s my idea. The teaching journals lack the kinetic energy of JRME and they lack the potential energy of blogs. By “energy” I mean that the energy of a piece of writing is partly kinetic – what the author actually wrote – but also potential. Given the right forum, readers will come alongside those words, offer their own, and co-construct incredible kinetic energy out of that potential. JRME articles have low potential energy but incredible kinetic energy. Responses to articles are only published after months or years but the articles themselves and their ideas are often very well-researched and very well-written. Articles in the teaching journals have lower kinetic energy than JRME articles (because it’s much harder to publish in JRME) and their potential energy is … also pretty low. For example, Albert Goetz’s response to my modeling article appeared 11 months after the original publication. That latency won’t allow us to convert the potential energy of my article into anything kinetic. Short of taking down the paywalls, I don’t have a great idea for increasing the potential energy of the teaching journals. My colleagues Zak Champagne, Mike Flynn, and I have put in a great deal of thought trying to increase the potential energy of the conferences, though. 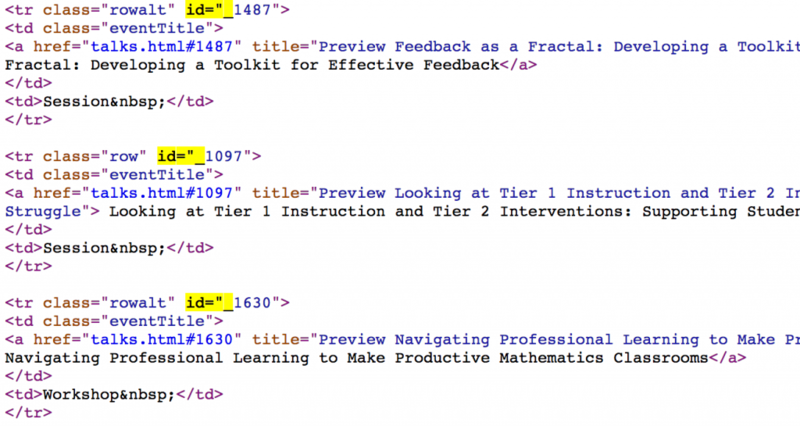 For two years now, NCTM’s leadership has given us some room to play around with the very simple idea of giving every speaker a webpage for their conference session and then getting out of their way. Relative to dropping the paywall on the teaching journals, this is a very cheap idea. Here is an area where my intuition totally failed me. My assumption was that math teachers who have found community online for free are less interested in paying money to find community in some distant city at an annual or regional meeting. Feel free to scroll through the comments and read person after person describing how much more interested they are in attending a national conference knowing their online community will be there also. NCTM needs to do everything they can to import and export that community. NCTM can support these blogging and tweeting attendees after the conferences by giving them lots to blog and tweet about. Feed the community. It seems no one is tweeting about the teaching journals. But lots of people are tweeting about the release of the videos from the Ignite and ShadowCon talks. Jo Boaler’s talk was at capacity with a thousand people locked outside. You wouldn’t know from her conference listing that someone captured video of that talk. No one knows where to find it so no one is talking about it. Fix that! Give every speaker a webpage. Help them understand how to turn its potential energy into kinetic energy, how to turn isolation into community. Again, I imagine my needs are pretty idiosyncratic. I’ve been spoiled by blogging and tweeting and by the teaching community that lives on my phone and travels with me in my pocket wherever I go. So what are your professional needs? How well has NCTM been servicing them? What hopes do you have for its future? Please read NCTM President Matt Larson’s response to my post. His description of NCTM’s advocacy efforts was particularly useful. Also read NCTM Past President Linda Gojak’s comment. Is the role of NCTM to be the leader of the frenetic #MTBoS blogosphere? Or is it to be the slow, more “craft beer” or “fine wine” place for ideas to ferment? What is the in between? Make your suggestions known because it is hard to be both. The editorial board of TCM (full disclosure – which includes me) is working hard to create some kinetic energy around the journal. We are hold a #TCMChat each month on twitter around the free preview manuscript (Which coincidentally means we tweet the heck out of link to the free preview every month). Early Friday morning of NCTM, I attended a focus group to discuss the future of NCTM and more specifically, their partnership with the Math Forum. Many issues were discussed including the ones you bring up here. But one that seemed to resonate with everyone in attendance was the people who work for the Math Forum. Joining the Math Forum and NCTM has given NCTM a face and a personality exemplified through the wonderful people that make up the Math Forum. They have helped bridge the divide, physically and metaphorically, between NCTM and the greater Math Twitter Blogosphere and have been a catalyst for the continuing conversation between these groups. I have (what I think is) a really great linear systems lesson that I developed with my brother. It’s been accepted for publication in MT but it’s going to be about a two year gap between submission and publication. But for me as a part of a community which already shares ideas freely, comments on them, improves them… I don’t see how an NCTM journal can compare. Immediacy, feedback, and encouragement make blogging the choice for me. Mary calls out her interest in extending the conversation in several sessions she attended. NCTM can support this. There were several K-2 talks I attended at NTCM that I would love “to continue the conversation.” I tried Twitter, but the sessions had low turnout so there was no interaction. One was ELD and math, giving students position and power. They used Go Pros to observe from a child’s perspective and introduce change to their teaching. It was awesome; every k-2 teacher should have been there and needs to think about how we are giving voice and power to our students. In regard to Advocacy, it isn’t all invisible. Check out http://www.nctm.org/news/ for NCTM press releases as well links to press coverage (with quotes from NCTM Presidents). Julie Wright adds an appeal for participation in your local affiliate. My talk from the 2016 NCTM Annual Meeting is online. I won’t claim that this is a good talk in absolute terms or that this talk will be good for your interests. I only know that, given my interests, this is the best talk I have ever given. My premise is that we’re all sympathetic towards students who dislike mathematics, this course they’re forced to take. 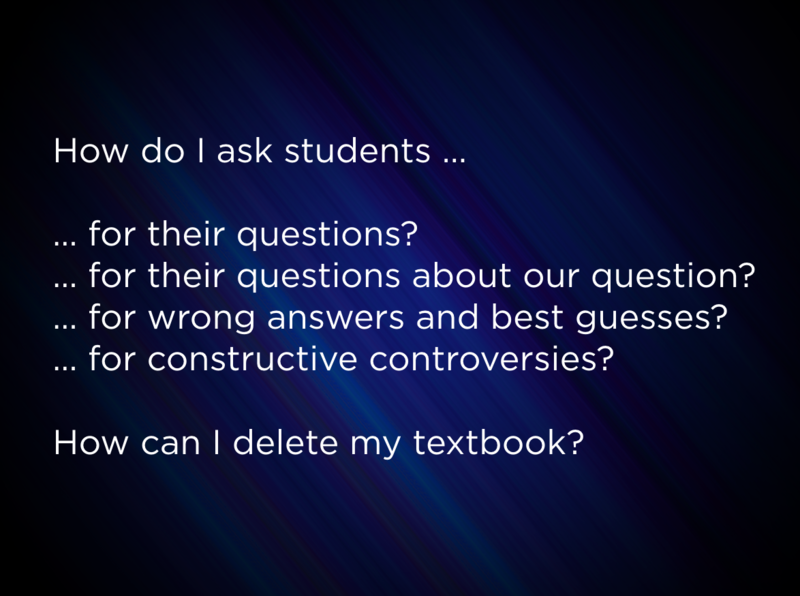 We all have answers to the question, “What does it take to interest students in mathematics?” Though those answers are often implicit and unspoken, they’re powerful. They determine the experiences students have in our classes. 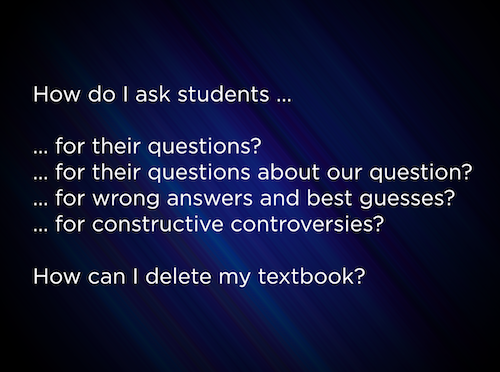 I lay out three of the most common answers I hear from teachers, principals, policymakers, publishers, etc., two of which are “make math real world” and “make math relevant.” I offer evidence that those answers are incomplete and unreliable. Then I dive into research from Willingham, Kasmer, Roger & David Johnson, Mayer, et al., presenting stronger strategies for creating interest in mathematics education. My call to action will only make sense if you watch the talk, but I hope you’ll take it seriously, give it a try, and let us know how it goes. BTW. I’ve already received one email asking me, “Wait? Are you saying never make math real world?” No. My principles for instructional design often lead me to design applied math tasks. But “make math real world” isn’t a great first-order principle because, as a category, “real world” is poorly defined and subjective to the student. This was a really helpful talk in illuminating why it doesn’t work to simply drop a mundane math task into some sort of “relevant” or “real-world” context. And it was great that you didn’t stop at deconstructing these unhelpful approaches, but instead went on to share specific ways to think, steps to take, and tools to use to increase engagement and thoughtfulness in our math classrooms. A very natural follow-up to the famous “Math class needs a makeover” talk.